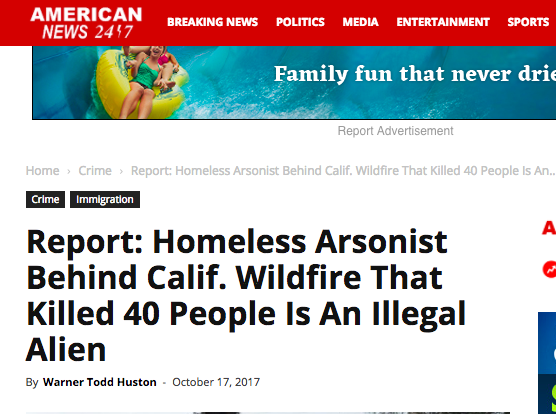 In the aftermath of the catastrophic wildfires that have left at least 42 people dead and thousands of homes and businesses destroyed in Northern California, right-wing media outlets reported that an undocumented immigrant was arrested in connection to the fires. The rumors flared after officials arrested a 29-year-old man in Maxwell Farms Regional Park last weekend. Jesus Fabian Gonzales, a homeless man “known to deputies,” had started a fire to keep warm, Giordano said Tuesday. Gonzales, who frequented the park, was seen “walking away from a small fire” on Sunday afternoon carrying a fire extinguisher and lighter, the sheriff said. Gonzales is currently being held in Sonoma County jail on a $100,000 bond and there is no evidence linking him to the dozens of wind-fueled fires that erupted last Sunday, torching nearly 200,000 acres across the region. 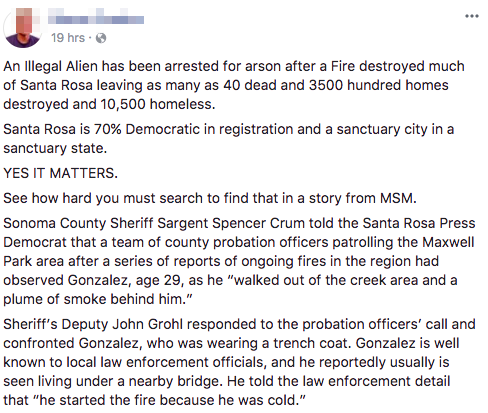 On Monday, the Santa Rosa Press Democrat published a story about the arrest. Then Breitbart, the right-wing website run by President Trump's former chief strategist Steve Bannon, picked up on the report. Breitbart reported that the US Immigration & Customs Enforcement Agency (ICE) issued a detainer request for Gonzalez and, without any evidence, claimed he was arrested on suspicion of arson in the massive wildfires. While many in the region are still clamoring for answers about how the raging wildfires — now the deadliest in California history — were ignited, many people began sharing the story on social media. “The Santa Rosa fire was not started by climate, it was Arson by an illegal alien, in a sanctuary city,” one user tweeted to President Trump. The report ricocheted across right-wing media outlets, including InfoWars and the Drudge Report, which shared Breitbart’s unsubstantiated claims. “Jesus Fabian Gonzalez is now sitting in the Sonoma County Jail on suspicion of arson for being at least one of those responsible for the rash of fires that have devastated California this month killing at least 40,” wrote American News 24/7. Since the fires began, officials have been continuously reassuring the community that ICE would not be targeting undocumented immigrants who sought refuge at official shelters. Dozens chose to camp at beaches, sleep in cars, or stay in churches, schools, and other pop-up shelters to avoid encountering any federal presence. Sonoma County Sheriff’s Sgt. Spencer Crum said that the only questions Breitbart News and InfoWars asked were about Gonzalez' ethnicity and whether ICE had placed a detainer on him. Crum added that while officials are still attempting to quash the rumor, it has been “the first really crazy one” they've had to deal with.